If you experience a flood due to a storm, you can call the water damage Valencia West pros at 911 Restoration of Tucson, and we will arrive within 45 minutes to begin pumping the water out of your household. We are available 24/7/365, and always bring professional grade sump pumps, wet vacuums, air movers and dehumidifiers to begin clearing out the water and drying the property as soon as we arrive. Our Valencia West water extraction crews will conduct a free home inspection as soon as we arrive to make sure that everyone understands the extent of the damage and the work that needs to be done. The water damage Valencia West team knows that the best way to prevent such incidents is to be at the scene as quickly as possible with the right tools for the job. So, call us today and out Valencia West flood damage eradication professionals will give you the fresh start you and your family deserve. You can prepare for storms by installing a standby generator, which will allow you to continue to have some electricity to run the essentials, such as your refrigerator, if a storm does cause you to lose power. Storms and other severe weather can overload your power grid, causing power outages and blackouts. Having a generator in the home can even reduce your chances of incurring flood damage because it will keep your sump pump running during heavy storms. Generators are installed outside your property and powered by liquid propane or natural gas. It is then wired directly to your household’s electrical system, allowing it to automatically restore power within seconds of an outage. If it seems too expensive to buy a large generator, you can opt for a smaller, portable one. They’re fueled the same way as the permanent ones, and are powerful enough to keep a few appliances and lighting up and running. If you experience a power outage and find yourself dealing with subsequent water damage, call the Valencia West floodwater removal techs and they will begin same day services to get your home cleared of all moisture. Our Valencia West leak repair team knows that the cost of the repairs plays a big part in what kind of services homeowners are going to seek out. 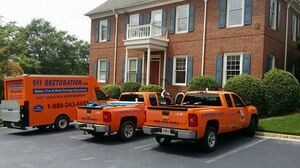 But we want you to know that when you hire us you can be sure that we will handle everything, from water extraction to home repair, so you will never have to hire another company to come in and finish the job. Out Valencia West flood mitigation techs will even help you file your insurance claim, taking over the entire process if you need us to. The bottom line is that whatever situation you find yourself in, you can count on us to make your home look better than new when we are done, and at an affordable price. So, call our water damage Valencia West experts with 911 Restoration Tucson and we will make sure you are taken care of the entire way through today!